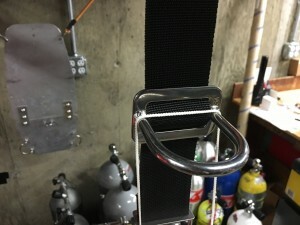 In the diving community, especially the technical diving community, there are a lot of “facts” thrown around related to best diving practices, equipment, training standards, etc. If you do a little research, much of what is stated as “fact” isn’t supported with much, if any, verifiable data. All of these, and many others, are stated often. Truth is, a perfectly valid and reasonable counter-argument can be made for any one of these statements. Beyond that, as water temperatures drop and conditions get rough, I suggest it is naive to assume equipment standards that are ideal for one environment are also the safest option for all environments. With that in mind, I decided to take a look into the ubiquitous D-ring. There are basically two types: Standard D-rings and welded ones. The standard D-ring is threaded onto the harness by capturing it between the webbing and the middle bar of a belt slide. 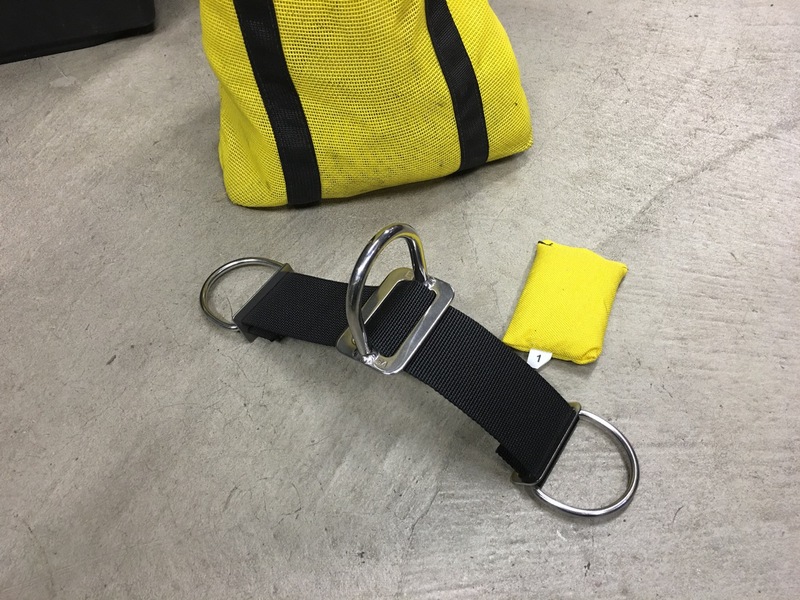 Welded or “fixed” D-rings are simply welded to the belt slide, so they can’t flop around. In theory, this makes them easier to find and clip things to. Personally, when wearing thick gloves, especially dry gloves, I tend to prefer them. Without gloves, or when wearing thin gloves, I like the lower profile nature of the floppy ones. But, which condition is safer? Am I actually more likely to become entangled using those 90 degree welded D-rings? To find out, I set up an experiment. One might argue that the welded D-rings are, by nature, more likely to come in contact with a line. (Of course, if there is a stage bottle hanging from it, that argument is moot.) 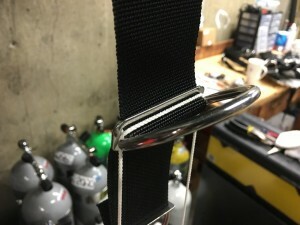 The standard D-ring can fold flat, whereas the welded one is fixed in a position sticking straight out from the diver’s hip. On the other hand, both would likely have an SPG clipped to it, in which case, neither would be laying flat. I decided to ignore that condition and focus on trapping line. I set up the experiment by threading both types of D-rings onto a short length of webbing. I hung the webbing, with the D-ring vertically, and weighted the bottom end to keep it hanging straight up and down. Next, I grabbed a reel and let out about a 2 foot loop of standard line. I clipped a weight bag to the reel and hung the loop over the D-ring. For each, I then begun adding weight to the bag to see how much it would take to send the reel crashing to the floor. I started with the floppy, standard D-ring. As I added weight, the line wedged deeper and deeper into the corners of the ring under the webbing. It didn’t matter that I turned the D-ring upward to better hook onto the line. It was that gap where the D-ring is in contact with the belt slide where the line was pinched. 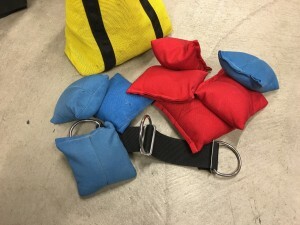 Eventually, I placed 36 pounds of weight into the bag. The line was beginning to stretch very tightly, so I stopped there, but it was obvious I could keep adding weight until the line would break if I wanted. Now on to the rigid ring. The D-ring I used has no gap in that position to trap the line. As a result, the loop of line would slip right off the ring no more than a degree or two form horizontal. I couldn’t make it catch the line, and had to hold it in place while I added weight. Even then, the most I was able to get the rigid D-ring to hold was 1 pound. My experiment suggests, even if the welded 90 degree D-ring is most likely to come in contact with a line, it is far less likely to trap it. 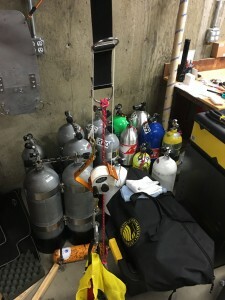 Obviously, there are factors I’m not considering, but to me, this is compelling enough to ask just how many of our standard technical diving principles came about. How much of what we believe to be critical safety issues, is in fact, just opinion? Fixed 90 degree d-ring could only “trap” 1 pound. My own opinion about welded vs. non-welded D-rings is that there are so many things attached to the diver’s body that will become entangled long before a D-ring, that it makes little difference which one he or she chooses. Further, entanglement is far more likely to result from inexperience than from an inch and a half loop of stainless steel. My suggestion for every diver is to practice as much as you can, gain experience slowly and use every piece of gear in shallow, open water before taking it on any complex, technical dive. 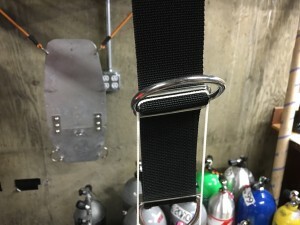 This entry was posted in Diving Safety, SCUBA Gear Reviews, Technical Diving and tagged backplate, BCD, diving equipment, tec gear, tech gear, technical diving.